it's the last day of march which means a quick little goal update. for the past 3 months (1/4 of the year) my biggest goal has been to try to get to bed by 12:00. i can't even believe how badly i'm doing with this goal. it's so bad that i'm giving up. i don't usually give up on goals, but i am this time. i know sleep is important, and i thought if i really tried hard to focus on it things would improve. the opposite has pretty much happened. my bedtime has gotten worse and worse. i need to find better balance in my life and hopefully a slightly earlier bedtime will naturally happen. i'll let you know how it goes. if you have any tips, i'm all ears. speaking of goals, i have a big one coming up. i'm running the nashville marathon in less than a month. 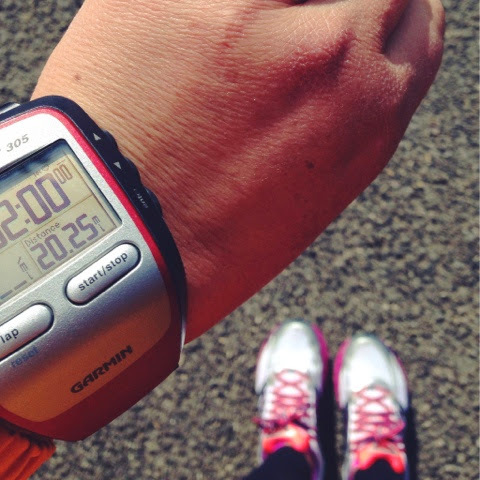 i've talked about running a lot including my full running story. this isn't my first marathon. i've done quite a few 20+ miles runs. sometimes you have good days, and sometimes you have bad days. my run on saturday was one of those bad days which is really unfortunate. this is the longest run before the marathon. we spent the first 2 hours running mostly uphill which nearly killed me. from then on it was hard really really hard. i run with a group which usually means i am not by myself. my running was so bad on saturday that i was by myself much of the time. it gave me a little time to think. i thought a lot about this big goal i have of completing a marathon. i thought about goals. sometimes we have goals that push us beyond our limits. some days are bad, and some are good. sometimes we want to just quit. i know i know. i am quitting my bedtime goal, but for the most part i stick with things. there is such a sense of accomplishment that comes with goals. i started out saturday morning way before the crack of dawn with a goal to run 20 miles. it was challenging, difficult, miserable, terrible, brutal, painful, etc. around mile 12 i said "these next 8 miles might kill me", and one of my wise running friends reminded me to take it one step at a time. in the end i accomplished what i set out to do. i stuck with it. even though it was hard, i was grateful to have a goal. what goals are you working on? what do you do when you just want to give up? I don't know how you do it. I couldn't even dream of running that far haha! you are amazing! You are amazing!!! I'm up to 16 miles.... Is 20 the longest you're supposed to go before the actual marathon? ?